The band have been confirmed to close the 2016 festival and it's seriously dividing opinion. Coldplay were the first headline act to be confirmed for Glastonbury 2016 today, taking to Twitter to reveal they'd be closing the festival on Sunday 26 June. The gig will see Chris Martin and co. headline the festival for a record-breaking fourth year, following their Pyramid Stage slots in 2002, 2005 and 2011. Naturally, it's opened up a LOT of heated debate, with some punters vowing not to return to the festival, others defending the four-piece and telling the moaners to grow up, and the rest just starting useless petitions about it. 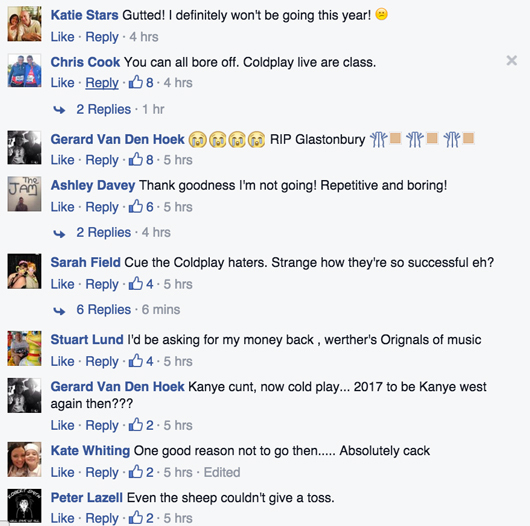 And those were just some of the comments on the Radio X Facebook page! I saw Coldplay at Glastonbury back in 2011 and it remains one of the very best shows I have ever seen. Come at me Twitter. We doubt that Coldplay are losing sleep over it, however, considering they just played a life-changing gig at the Super Bowl 50 halftime show. If that wasn't impressive enough, the band are set to pick up their Godlike Genius gong from the NME Awards tomorrow night on Wednesday 17 February, where they'll also close the show with a set of their greatest hits.